Premier Complete Dentures - Dentures provide a second chance at a beautiful smile. Its a combination of art and science. We create a new bite when many teeth are missing. You gain confidence and an improved self image. Premier Dentures support facial structures, assist with speech, and permit normal diet and nutrition, all of which are compromised when teeth are missing. A full denture replaces all the teeth on the upper or lower jaw. Dentures can be very attractive. When existing teeth don’t have to be matched during tooth replacement, a large opportunity exists for creating ideal color, shape and position. It’s not unusual for a smile with a denture to look better than the original ever did. Denture fit and appearance may change over time, but there are a number of ways to re-establish them. If you feel have changed over time, contact us and we can offer you some options. 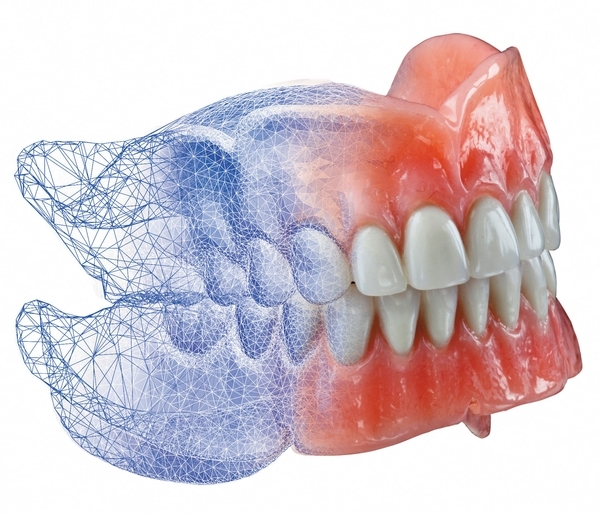 Our center can design and fabricate four different types of denture: Economy Dentures, Elite Dentures, Premier Dentures, and Dental Implant Dentures. 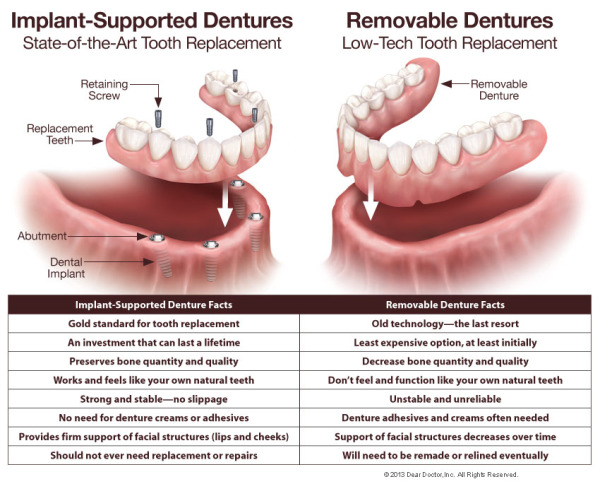 DENTAL IMPLANT Dentures - Dental Implant Dentures are as close to natural teeth as you can get. This technology has revolutionized dentistry. Implants can improve the quality of your life, they can last a lifetime and are proving that traditional dentures can be a thing of the past. Dental Implants eliminate the day-to-day frustrations and discomfort of dentures. You can enjoy the same dietary freedom shared by those with natural teeth. Dental implants increase the strength and retention of dentures so that you can bite into an apple or eat a steak. 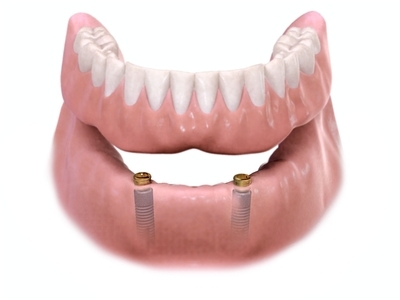 Implants can even be used with your existing dentures. Furthermore, you can remove that uncomfortable plastic that covers the roof of the mouth. The surgical process is minimal and sometimes the implants can be put into function immediately. We do provide sedation to keep you comfortable. Dental implants can improve the quality and freedom of your life! CLICK HERE to watch and learn more! We speak English, Russian, Spanish, French, and Portuguese. Premier Dentures : Where art meets science and technology. Dental Implant Dentures: As close to natural teeth as you can get. Missing teeth are nothing to smile about. Putting vanity or aesthetics aside, missing teeth can cause a number of long-term issues — including bone loss. Yet, an estimated 140 million American adults live with one or more missing teeth. Over time, missing teeth can cause the face to loose definition and have a drawn in, distorted look, caused by the loss of bone and natural shape. With the advancements in dental Implants over the years, there’s one less reason to live with the discomfort — and potential problems — of missing teeth. Dental implants prevent additional bone loss, give bone height and add definition to the face. And, today’s dental implants are so amazing, with proper care, they can practically last forever. It’s almost impossible to tell the difference between a dental implant and the patient’s own teeth. Even denture wearers have a more comfortable alternative with dental implants. No longer do they have to go through life with wobbly, ill-fitting dentures or loose bridgework. 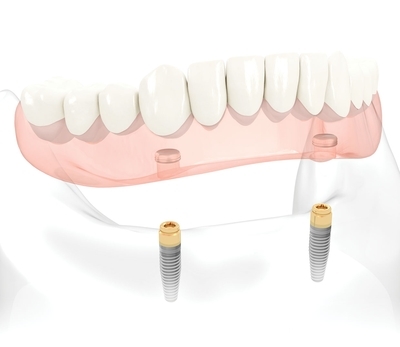 Dental Implants replace dentures with a natural — practically original fitting alternative. By placing a titanium post into the bone as a replacement for the original root with an attachment that comes through the gum, a crown, bridgework or denture can be permanently attached to the implanted post. The procedure is painless and can be done under local anesthesia. There are a number of ways to replace multiple teeth with dental implants. Usually, several teeth are “bridged” by two or more implants to support a space of several adjacent teeth with the crowns being fused together in one solid unit. The decision on whether or not to use a single or bridged implant should be made by your doctor. Choosing dental implants over a bridge or dentures has a lot of advantages. Not only do implants eliminate the many problems and drawbacks associated with dentures and bridges, but they even allow people to eat, speak and laugh normally. Most patients do not realize that bridges can actually loosen other teeth and even cause more tooth loss over time. With dental implants, denture wearers no longer have to contend with slippage, wobbling, discomfort and in many cases, pain. Without teeth, the underlying bone deteriorates and the denture no longer fits properly. Dental Implants can also stabilize existing lower dentures by anchoring them into place using mini dental implants, improving the patient’s ability to eat, speak, laugh and smile. Generally speaking, root canals have about a 70-85 percent success rate. If a root canal re-treatment is indicated, the success rates decline to less than 50 percent. It makes medical sense for the patient to go with the traditional root canal procedure initially, if it does fail, the next sensible step is a dental implant. Dental implants are the most advanced method to replace missing teeth, save bone structure and improve the quality of life for denture wearers.